After finishing school, in 1979 Lexi became the Fashion Editor at The Star Newspaper. She left journalism for the film industry in 1983 and worked as a Production Manager, Assistant Director and Film Editor. 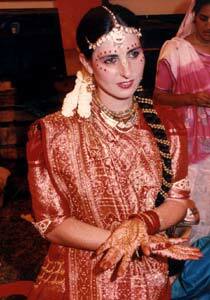 In 1986, she moved into an Indian temple for a 10-year spiritual sabbatical. There she married an Indian devotee and they had a son together  Godrume Behari. After leaving the temple, Lexi did business with India, importing stainless steel and soft home fabrics. She opened a décor shop and finally went on to teach Indian cooking in South Africa and America. She has traveled India extensively on pilgrimage, business and holiday. Lexi lives in Johannesburg.
" The excursion to Goa and Kerala takes my breath away. It has all the right elements for a perfect holiday. It is gloriously indulgent, relaxing and recuperative. You will be pampered like never before, in a place that can only be described as heaven on earth. Here you will find the centre for ayurvedic massage and herbal treatment centres, and the essence of ecclectic culture, cuisine, shopping and entertainment. Nothing and nowhere else can be compared - it has to be top on your list of must-do holidays."